The groundwater in and around the State Industries Promotion Corporation of Tamil Nadu (Sipcot) in Cuddalore contains carcinogenic chemicals and is unfit for human consumption, according to an analysis by the Sipcot Area Community Environmental Monitors (Sacem). Many of the main parameters were found to be higher than permissible levels, including total dissolved solids (TDS), total hardness, pH, turbidity, magnesium, calcium, sulphates and chlorides as prescribed by the Bureau of Indian Standards. 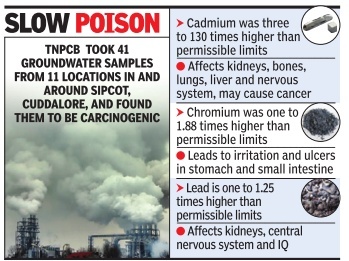 Tamil Na du Pollution Control Board (TNPCB) analysed samples from 11 locations, including two outside the Sipcot complex between February 2013 and April 2014. Sacem found samples had major toxin levels much higher than permissible limits and that the water was unfit for consumption. It released the analysis on September 17 at Cuddalore. The Sacem analysis found that samples from four locations, including overhead tanks that cater to drinking water needs, contained high levels of carcinogens like cadmium and chromium and other toxic heavy metals like lead and iron. The levels of cadmium in samples collected from Sipcot project office and other locations were three to 130 times above permissible limits. Similarly the levels of chromium were one to 1.88 times higher than the prescribed limits and the levels of lead one to 2.5 times higher than the prescribed limits in samples in and around Sipcot region. Residents, who consume contaminated water, have been exposed to potential health hazards, warned Sacem. Continuous intake of cadmium will cause abdominal pain, nausea, vomiting and intestinal bleeding and will affect kidneys, bones, lungs, liver and nervous system and could lead to cancer. Chromium intake causes irritation and ulcers in the stomach and small intestine and lead to anaemia while lead affects kidneys and the central nervous system. Children exposed to lead have shown slower growth rate and mental development. Lead also af fects the IQ and behaviour of children. “The supply of water to industries is dependent on groundwater. Since the aquifer in the Cuddalore region is close to the coast and there is the danger of seawater intrusion in the event of severe depletion of groundwater, quality of groundwater has severely deteriorated. Data shows saline intrusion has occurred in the Cuddalore coastal area,” ADB said in a report. Sacem urged the government to provide drinking water as per world health organization’s guidelines, to Sipcot residents and to ban discharge of industrial effluents on land. It also sought moratorium on extracting groundwater for industrial purpose and setting up of polluting or water-intensive industries in the region. The government must shut down industries that illegally extract groundwater and ensure industries recycle waste water.